Enhancers are fundamental regulators of gene expression that operate far away from gene promoters, looping to contact their target genes. Different patterns of enhancer usage allow fine control of tissue and stimulus-specific gene expression patterns. The patterns of genes expressed in multicellular organisms are critical for determining a cell’s identity, and for controlling how that cell responds to its environment. 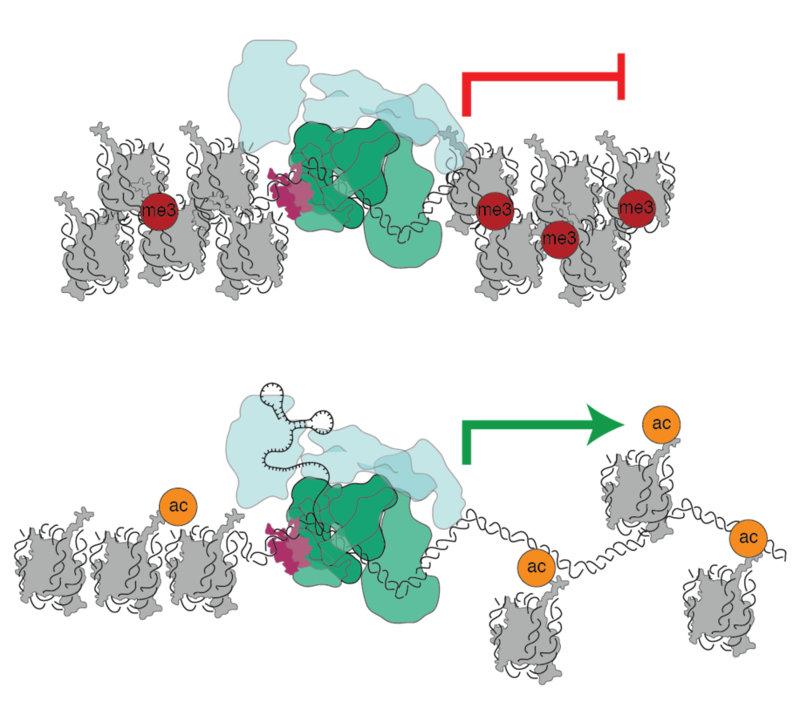 Gene transcription is regulated at regions adjacent to genes called promoters, but also from regions called enhancers that are often located tens-of-thousands of base-pairs away from the promoter. Enhancers are fundamental regulatory DNA sequences; they are crucial for driving development, and for generating cell-lineage specific transcriptional responses to environmental stimuli. Across the genome, enhancers have unique activities and their mutation and aberrant usage is causative for many human diseases, including cancer. A defining feature of enhancers is their regulation at the level of chromatin, i.e how DNA is made more or less accessible by epigenetic modifications of the nucleosomes that package DNA. This process of regulation is carried out by a vast array of epigenetic-enzyme machinery that controls accessibility. However, although enhancers display a spectrum of activities across the genome, the core machinery that modifies chromatin to drive enhancer function is largely conserved. In higher eukaryotes, DNA is packaged into a structure called chromatin. Tightly packed chromatin presents a barrier to gene transcription. However, chromatin structure can be regulated by post-translational epigenetic modifications of the histones that form nucleosomes around which DNA is wrapped. These modifications are controlled by a plethora of epigenetic-enzyme complexes to regulate gene expression. How are diverse activities achieved? We are interested in how different patterns of enhancer activity are generated from the core epigenetic-machinery, and how this regulation is disrupted in cancer and disease.